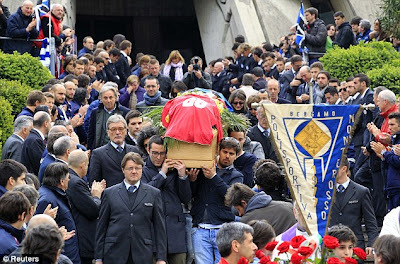 The funeral of Livorno on loan midfielder Piermario Morosini took place on Thursday in Bergamo, the city where he was born. Among those present at the service was Italy coach Cesare Prandelli and Ghanian star and former team mate at Udinese, Sulley Muntari. Morosini, who moved to Livorno on loan from Udinese in January, had made 18 appearances for Italy's Under-21 side. Maria Carla is severely disabled and lives in a nursing home in Bergamo and Atalanta president Antonio Percassi personally pledged to look after Morosini's sister Maria Carla for the rest of her life.